Up until this year, I’ve never really given velvet a second glance. 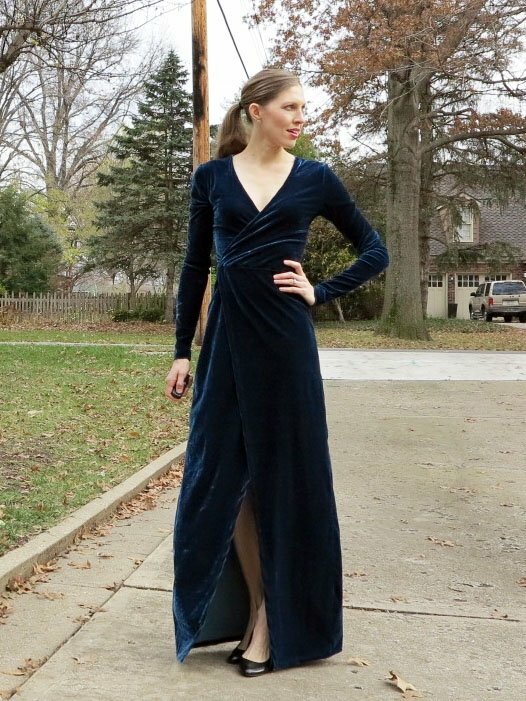 I used to walk past the carefully perched rolls of velvet at Tessuti Fabrics and sigh, and perhaps tentatively stroke them, but I couldn’t really see how such a lush fabric could fit into my wardrobe. This season is different. I’ve got images of velvet playsuits and blazers stuck in my head. I’d actually like to make all the velvet things but I had to decide on just one. I toyed with the idea of playsuit, but opted for a more classic style of dress instead. I think the simple design of this dress will have more longevity in my wardrobe. You’ll have to forgive the scrunched up sleeves and trust me when I say the fit is pretty spot on. I could scoop a smidgen more out of the lower back curve, but with normal walking/moving, those wrinkles aren’t actually that noticeable. I really just need an assistant to straighten me up before photos. The dress is a faux wrap design with a crossover bodice and wrap skirt. The fabric is a woven, not a knit. It contains some stretch, but not so much that would eliminate the need for darts/gathers or closures. I chose to add gathers to the bodice design and a zipper in the back. I hid the back darts in the back curve of the waist seam. I prick stitched the back zipper in place, adding a tiny glass bead with each stitch. I also made a detachable leather tassal. which I will secure to the zipper pull to aid dressing. I’m just waiting on a little spring clip in the mail. 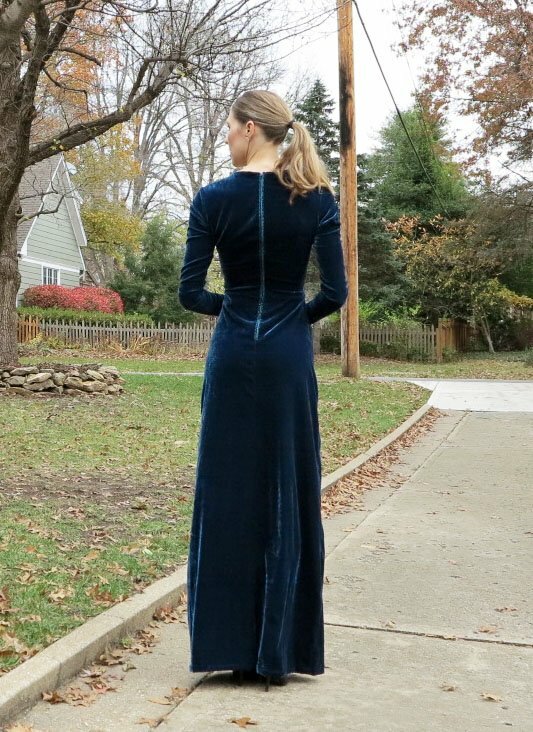 With regards to the fabric, I had my heart set on a deep teal, navy, or bottle green velvet. I couldn’t find what I wanted so I decided to dye the fabric myself. I purchased some natural stretch velvet and the necessary chemicals from Dharma Trading Co. I find their website quite informative and simple to use, particularly when trying to figure out exactly what I need for something I know nothing about. I used a Fiber Reactive Procion dye, regular table salt, and soda ash as the fixative. My velvet is a silk/rayon blend. It only stretches on the cross grain and is reasonably light weight (for velvet). It doesn’t require lining, but I’d consider lining it if I was working with a light colour. I’m actually really pleased with the quality of textile and absolutely delighted with the dyeing outcome. It’s important to note that the fabric shrinkage was quite significant after the first wash, but that information was on the website so I was able to order the extra yardage to account for this. Begin long/hot cycle. When water has filled the machine, pause cycle. Dissolve dye powder in water. Dissolve salt in water. Open machine door and pour in dye and salt. Close door and resume cycle. Run cycle for 15-30 min and then pause again (you need about 15min remaining for the soda ash). Soda ash should be dissolved in hot water – add this to the last part of the cycle. Start new cycle to wash out leftover dye, using Synthrapol as the detergent. Clean machine by running a cycle on empty. In terms of sewing with velvet, this was my first time. I knew to respect the nap, both in cutting direction and pressing, but I also learned a few other things along the way. Velvet is shifty to sew. 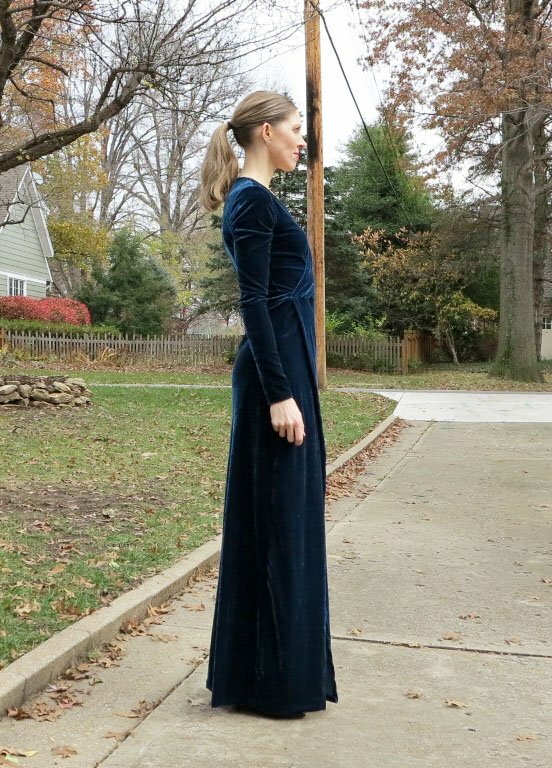 I wonder if the slight stretch in this particular velvet made it worse. My Pfaff has a walking foot which helped immensely. My serger hated the velvet. I only attempted one edge with the serger and then decided to pink the remaining raw edges. Hand-basting and lots of pins also helped deal with the shiftiness. Velvet seams finger press open beautifully because the pile shifts and locks the seam in place (a bit like Velcro). When ironing, I used a thick, doubled up towel, but I’ve heard another upturned piece of velvet works well to press on too. Velvet is a dream to blind stitch as the pile hides the stitches so well. I machine stitched the centre front edges of the skirt before I realised this (so I’m not very happy with the ripple along one side). The neckline, sleeves, and hem were all hand-stitched (the neck with bias binding) and the finish is much nicer. 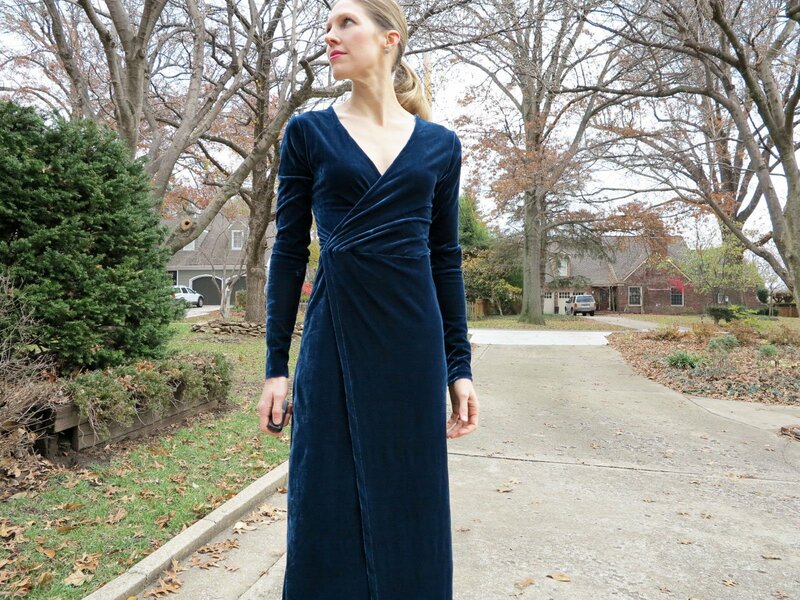 This entry was posted in dress, self-drafted, silk and tagged Dharma, dress, fabric, fabric dyeing, maxi, rayon, self-drafted, silk, velvet on December 2, 2015 by Debbie Iles.